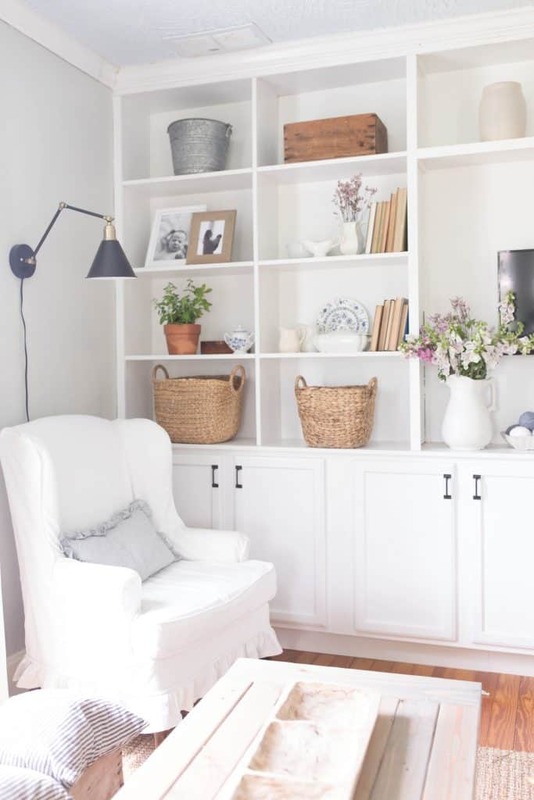 Bookcases and shelves are tricky to decorate and balance. 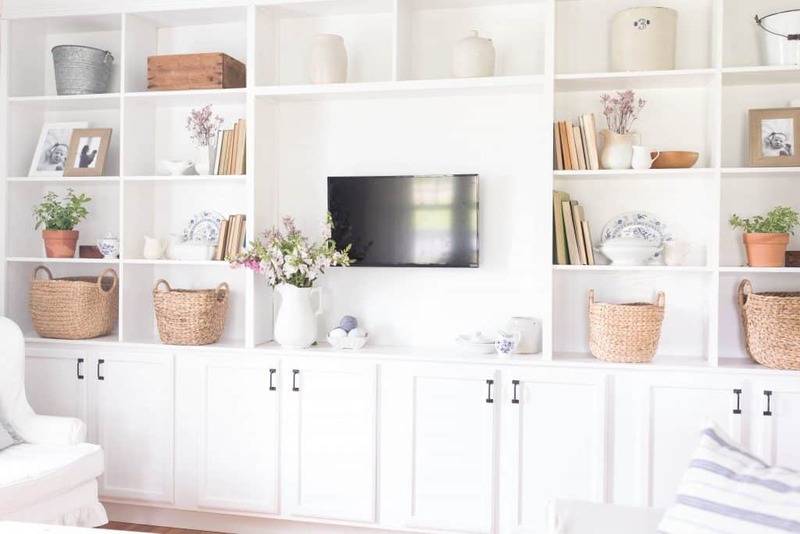 Learn how to style built ins with simple elements, like fresh florals, frames and antiques, in this video. 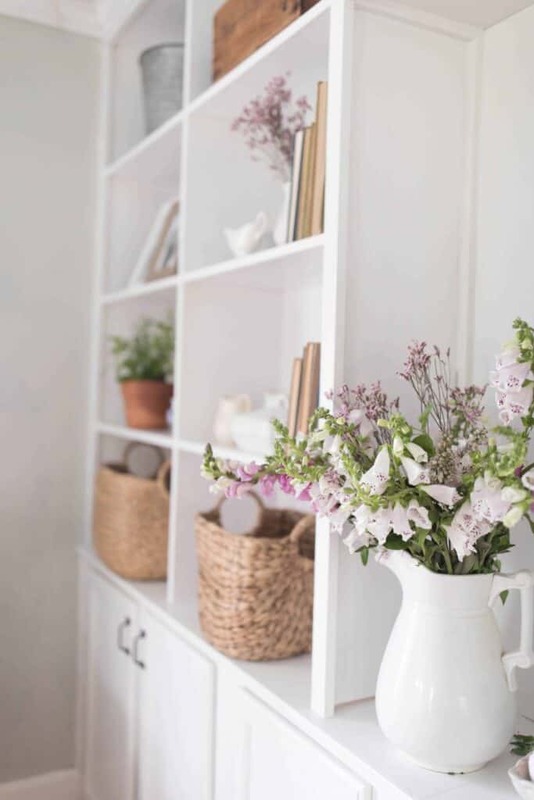 After our big magazine photo shoot I was left with several five gallon buckets of leftover flowers, and a house that was basically in shambles. 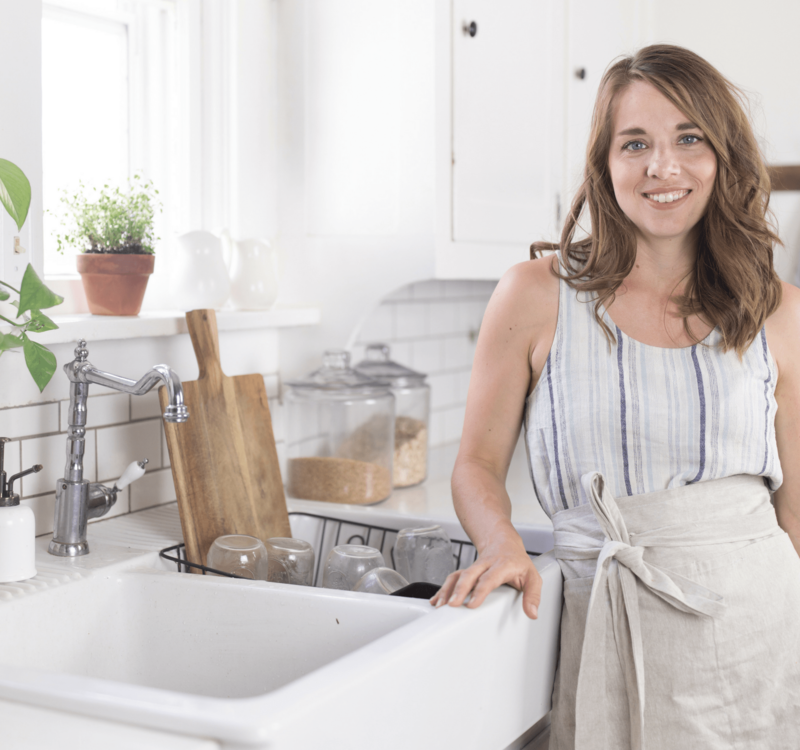 If you watched the behind the scenes video, you know that I basically restyled every space in our home to get that picture perfect shot for the magazine photos. We took down the TV and replaced it with a gorgeous wooden mirror. (Apparently the TV isn’t super photogenic! Haha.) I really wanted to leave it down, but my son, who just learned about video games, wasn’t feeling my idea. So, it isn’t pretty, but it has to stay. Sometimes practicality wins. When we were done with the photos, I was inspired to make use of the leftover flowers, and do a couple of refresh videos. First, I tackled the bedroom. You can watch that process in this video. Next, I went to styling the built in bookshelves in the living room. Something I didn’t anticipate about our built in bookshelves was how difficult they would be to style. Its tough to get that balance of filled in, yet not too cluttered. It is also challenging to make sure the shelves to the left of the TV are balanced with the shelves on the right. Select something large to anchor the bottom of the shelves. I used baskets all along the bottom row. They are also great for storage! 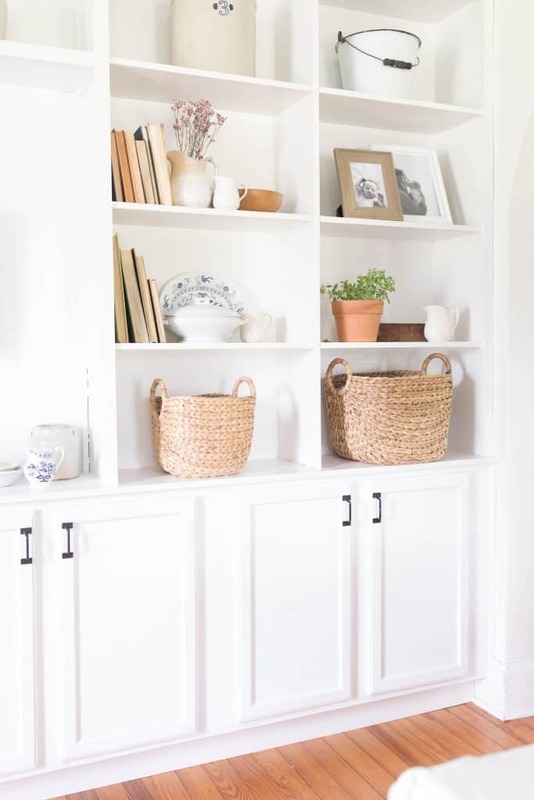 Keep shelves balanced with pieces of a similar shape and size on opposite sides. To prevent them from looking too cluttered, focus on natural textures and neutrals. I had colored pictures in my frames and they were throwing the whole color scheme way off. I swapped them out for black and white photos to make them flow better. 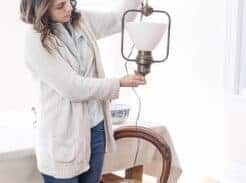 Use antiques sparingly. Shelves can start to look tacky very quickly if you throw in too many random pieces from garage sales and antique shops. Instead, focus on timeless pieces, like ironstone, crocks and wooden boxes. Bring in something fresh. 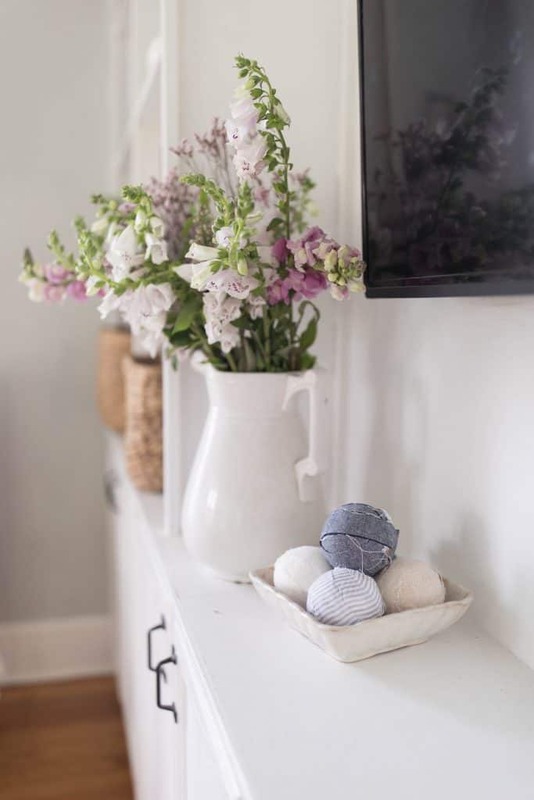 Our built ins never look quite complete without fresh flowers or potted plants. Use different heights and shapes on each shelf. For example, I paired a large ironstone pitcher next to a small one. They are balanced with a few books and a wooden bowl. Layers make shelves look more interesting and cozy. I put a potted plant and ironstone pitcher in front of a wooden box. I also created layers with my ironstone soup tureen and blue plate. Add in a little color. My favorite way to do this is with fresh flowers and plants. I also like to add in pieces from my blue ironstone collection. 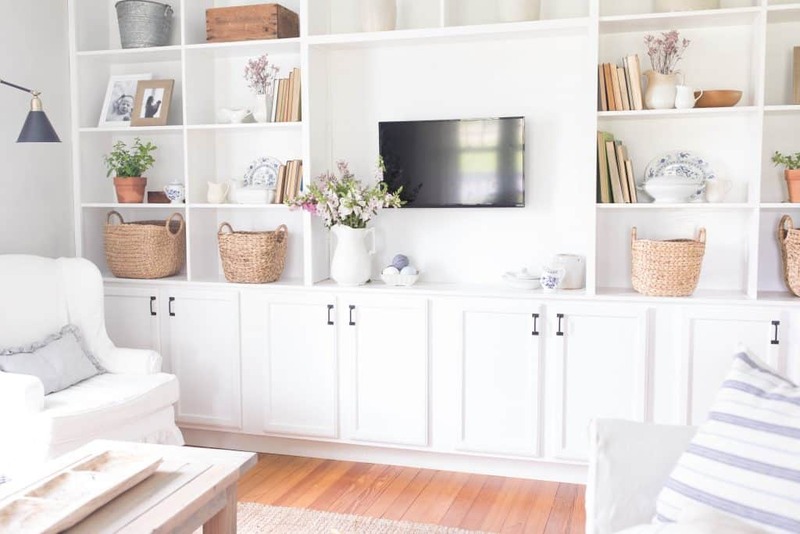 The key to styling built ins is patience, trial and error. Place something up there, step back, examine, move it, step back…repeat repeat repeat. I change my built ins up for the seasons. In the fall, the fresh flowers are replaced with pumpkins. I love to add greenery and stockings for the winter months. 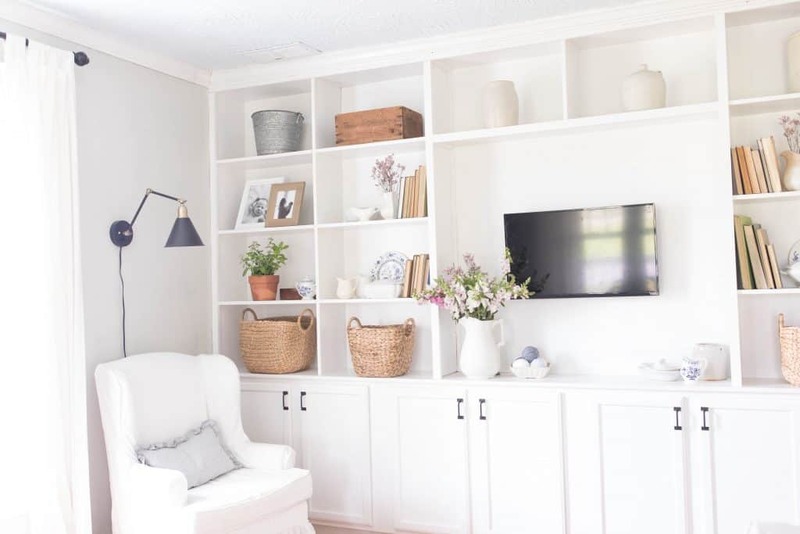 I hope these tips help you with decorating bookshelves and built ins in your home. I honestly didn’t even know they were poisonous. I had a few people point that out on Youtube. Whoops! They’re out now. Hi. I love the way you styled your shelves. I was wondering why you turned the books backwards?Thanks.